"The third of five daughters, Miss Mary Bennet is a rather unremarkable girl. With her countenance being somewhere between plain and pretty and in possession of no great accomplishments, few expect the third Bennet daughter to attract a respectable man. But although she is shy and would much prefer to keep her nose stuck in a book, Mary is uncertain she wants to meekly follow the path to spinsterhood set before her. Determined that Mary should have a chance at happiness, the elder Bennet sisters concoct a plan. Lizzy invites Mary to visit at Pemberley, hoping to give her sister a place to grow and make new acquaintances. But it is only when Mary strikes out independently that she can attempt to become accomplished in her own right. And in a family renowned for its remarkable Misses, Mary Bennet may turn out to be the most wholly unexpected of them all..."
The Unexpected Miss Bennet is one of the best Austen retellings or rip-offs that I've read. Really. Usually retellings of the novels themselves in diary format from the male POV are just tedious, and reading about Elizabeth and Darcy's married life is okay, but not that interesting. Instead, here we have a new story: Mary's story. In Pride and Prejudice, she's the sibling that everyone passes over: Jane is sweet and beautiful, Lizzy is pert, witty, and pretty, and Lydia and Kitty are young and lively. But Mary? She just moralizes and constantly plays the piano without getting better. Until suddenly she realizes that she wants more than just being the musician at Meryton assemblies, and Fordyce's sermons suddenly don't seem so appealing to her anymore. I really love the way that Patrice Sarath brings Mary to life. Suddenly, she's a full, three dimensional character, one we can relate to more, perhaps, then Elizabeth. After all, Mary is plain and until her transformation, dull and annoying, with her constant spouting of not-very-wise (or helpful) wisdom. Maybe it's a bit unrealistic that Mary would wait to have her existential crisis until the age of twenty, but I didn't care. 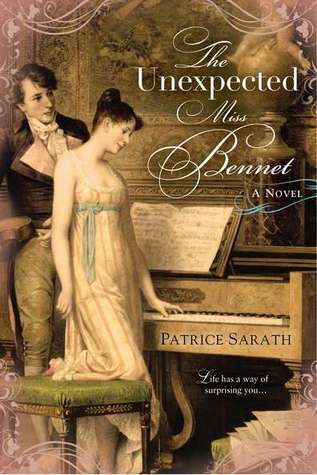 The Unexpected Miss Bennet was a really good book, and I'm glad I finally got a copy of it after waiting so long. I really liked the fact that the author talks about Mary and Mr Collins. I've always thought that they would have been a good match, and indeed, so did Mary when they first came. She thinks that they would suit each other really well, but then she realizes that even an odious man like Mr Collins looks right past her, has his eyes set on "higher" prizes, like Jane, Lizzy, and even Charlotte. It was great that that was touched on as a possibility for Mary. There were a lot of really funny moments in The Unexpected Miss Bennet, moments when Mary finally stops being so stuffy and jokes around a little bit (or what passes for joking in Regency England). When Mr Collins calls on her and her father, and Mr Bennet says sardonically, "Upon awaking every morning I ask myself, 'What would Lady Catherine do?'" Although not Mary speaking, that was really funny, and she finds it amusing. Mary and Mr Bennet also become a bit closer, sharing amusement and horror at Mr Collin's conduct, insinuations, and insults. Later, Mary is staying at the Hunsford Parsonage, and Mr Collins is talking about men being schooled and reading to improve themselves. Mary replies, "A pity it doesn't always work." Right back at you, Mr Collins! That was hilarious in a genteel, prim, Regency sort of way. Here's another sly remark on the author's part: "And they [Mr and Mrs Bennet] would stay no more than one night, for neither of them enjoyed being away from Longbourn for very long. For Mrs Bennet, it was her nerves. For Mr Bennet, it was Mrs Bennet's nerves." Anne de Bourgh, Lady Catherine's sickly daughter, is also developed as a character. This was kind of predictable, as she's the character besides Mary who's least described, but I really enjoyed her portrayal too. This happened in Mr Darcy's Diary but not as much and not as realistically. I really liked The Unexpected Miss Bennet's humor, wit, charm, and overall faithfulness to Austen's style. It's a very good Austen pastiche, and well worth reading if you're fond of them.